Steam locomotive A5 Class 4-4-0 No. 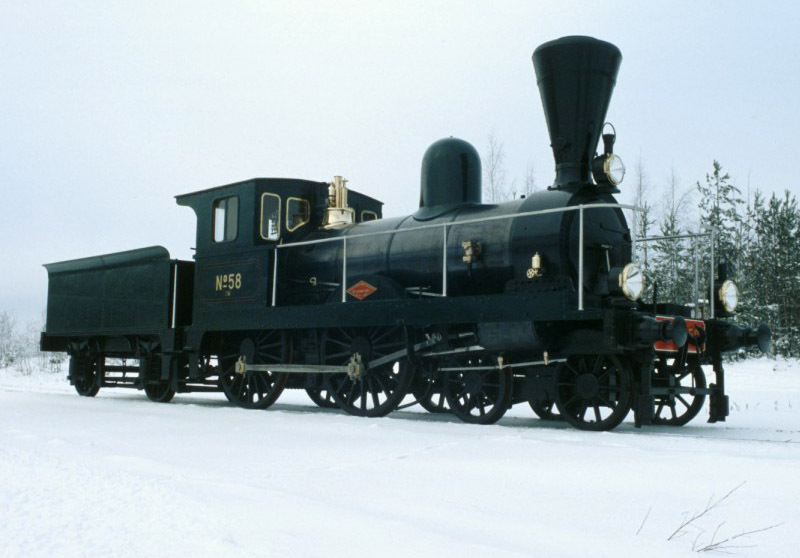 58 was the second of the two first locomotives to be built in Finland as a production experiment by Finnish State Railways to assess the advantages of locomotive building locally. This order from the Helsinki workshops in 1868 was placed at the same time as for ten passenger engines from England, all for use on the St. Petersburg line. The orders from both Helsinki and England were for engines of the same basic design. The ten from England were already produced in 1869 while the two Finnish examples were only completed in 1874 and 1875 because they were built between other jobs. The English-built locomotives were classified A3, the Finnish ones A5 Class Nos. 57 and 58. Because the Finnish-built engines cost fifty percent more than those imported, Finnish State Railways made no further attempts to enter locomotive production until over a decade later. A5 Class No. 58 was still hauling passenger trains in Southern Finland in the 1920s, and was used in its final years for permanent way trains for railway construction work. The A5 engines were nicknamed “Lankkihattu” (Polished Hat) because of their similarity to A6 Class engines known by that name with brass-plated domes. In 1876, A5 Class No. 58 was on show at the first Finnish general industrial exhibition in Helsinki that was attended by Alexander II.